Like a reformed smoker, evangelizing on all the negatives associated with the habit, people who have weathered overwhelming debt to achieve financial stability often develop the toughest attitudes towards those still struggling to overcome ineffective choices and self-limiting behaviors. Most recently those ineffective choices and self-limiting financial behaviors seem to include a negative personal savings rate at a national level. As a result, many financial experts and average Joe consumers are deeply disturbed by this development. 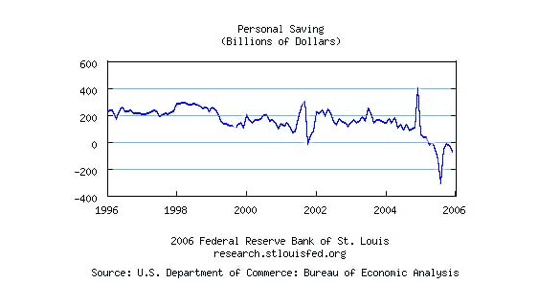 What does savings rate mean? Actually, it doesn’t mean the amount of money you tuck away each month in a savings account or 401(k). Our nation’s personal savings rate is determined by subtracting our overall spending from our total income to find what remains. In other words, have we spent more than the income we’ve brought in? According to our friends at bankrate.com, a negative savings rate means “you’re spending more than you earn, so you’re dipping into your savings or you’re borrowing to pay for purchases.” Yikes. That doesn’t sound good for the long term. Now, I think most of us can agree that saving is important – for emergencies, retirement, our children’s education – and saving can help us maintain our standard of living and in some ways our quality of life during difficult times. But gosh darn it, sometimes saving (the way we all truly know we should), is just plain hard. Between increased expenses, income that is not keeping pace and spiraling consumer debt, it seems increasing saving rates will require focus and discipline many of us feel we just don’t have time for. Unfortunately, although that statement may sound true at first, if we consider the consequences, is it really? Save something. Don’t worry about the amount being too small. Even tossing the change from your pocket into a jar at the end of the day will begin to add up. Bring your lunch to work. Be it leftovers from dinner, a sandwich you’ve made, fruit or something else, it will save you money and most likely is better for you than stopping at that fast food place – taking the thought a step further – could potentially improve your health to help you save on medical expenses. Finally, make it easy – go automatic. Check with your employer or your banking representative about auto-deposit and auto-deduction saving programs that you don’t have to touch, adjust or spend ‘time’ worrying about. So come on, you can do it. It’s time to do it right with effective choices and liberating behaviors.